We have also used Bluetooth module HC-06 in our previous project: Voice controlled LEDs using Raspberry Pi. Also check our previous Raspberry Pi Projects along with some good IoT Projects. 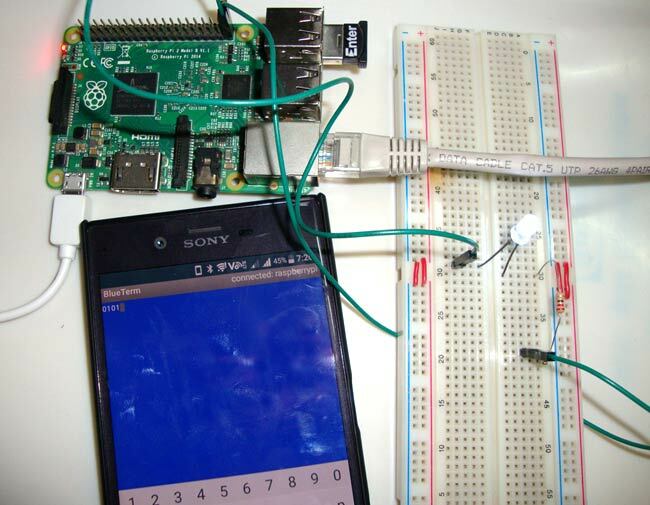 So this is how you can wirelessly control the GPIO Pin using an Android App over Bluetooth. Also check How to use Bluetooth with Arduino. server_socket.bind(("", port):- Server binds the script on host '' to port. I can't seem to get the pairing to work. When I type in "pair" and then the address that comes up for my phone, i get the error "org.bluez.error.AlreadyExists". Any help for how to work this would be very much appreciated. nice work. I couldnt type anything in Blue term app ?? can I know what is the full name of the usb Bluetooth dongle type that being use? I plan to buy it. What should I do if the message is "org.bluez.Error.Blocked"? I have had same issues. i start study raspberry pi on yesterday. so i use my day looking for tutorial, watch video, read article do follow instruction so many hours with no lucky. then i found you in YouTube that link to here, and it works! I wanted to know can you send strings from app to pi. I tried a lot but I was getting this error repeatedly. If anyone has the solution please do reply here. I suspect that is something related to the use of Wifi and Bluetooth simultaniously. Nothing happens when trying to connect via BlueTerm. I had the same problem. I got it working by changing this: if (data == "0") by this: if (data == b'0'). I hope it works for you too!!!! Will this work in Raspberry pi 3, if I want to use the internal bluetooth? what if I want to us the internal bluetooth and the external UART port(TTYAMA0) for a GSM module simultaneously. What should I do? Someone please hekp me with this. Yes, it will perfectly work on Raspberry pi 3 internal Bluetooth, I have one and I made it work. Thing is that Rpi has only one UART interface: UART0. So you would have to choose between Bluetooth or the UART port. Anyway, you could buy a USB to UART controller and use it for the GSM module, and use at the same time the internal Bluetooth.